An important maxim of Deng was, "It doesn't matter whether a cat is black or white, as long as it catches mice". Well, this maxim is not for Indian politicians. They want everything in India - Roads, Utilities, Bridges, Government Schemes - to be named after them or their political mentors/ideologues. Its not about whether the scheme achieved its objectives but about stamping their name on everything. Whenever I visit home town, I could see Local MLS's name in big font on all flood lights in junctions, bus waiting sheds built using public money. Politicians want people to remember them for a very long time, if possible forever; but they are neither ready to spend their own money nor raise money (outside government treasury) for that purpose. You might be thinking what this has to do with UPA/ NDA. Well, there is a bad habit taking root in New Delhi. 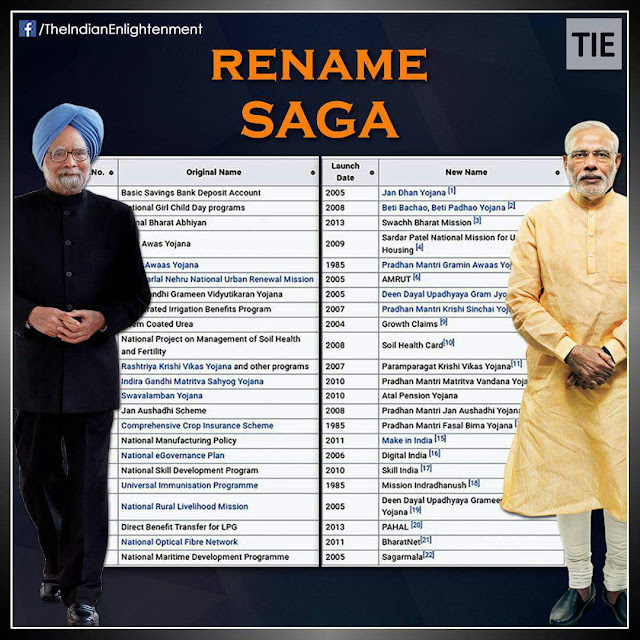 Current administration is renaming all schemes started by UPA one after other. Relaunching same scheme, with minor modifications, with a new name (name of party ideologues etc.) is not a good habit. If someone wants to make their mark on India's economical story, they can do better execution of old schemes or start new ones with new objectives. What UPA lacked was not ideas but lack of execution efficiency. So, show them that, current administration can do it in a better way. Renaming all schemes is not a good trend; if another administration came to power in Delhi they can rename everything again. In short don't claim another's baby. Latest scheme getting renamed is, Prime Minister's Rural Development Fellows scheme (PMRDF). 3. Photo in this article is copied from Twitter.